If like me, your afternoon pick-me-up includes an endless string of cat videos on YouTube, I’d like to recommend the Creatures Comfort Facebook page. The no-kill rescue facility posts adorable photos as well as heartwarming rescue stories with happy endings. This furball was found on the side of the road in Lummi. She was given to Goldie, a Creatures Comfort signature story, who played surrogate mom to her after Goldie’s own litter was rescued from dogs. Photo credit: Chelsea Mathews. Lois Wade started Creatures Comfort – whose mission is to improve the lives of feral cats in Whatcom County – out of her home 30 years ago. 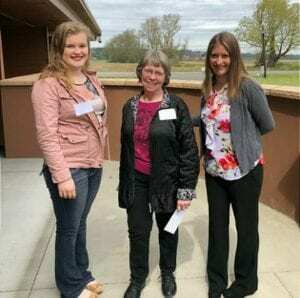 Siva Jacobs (left), Lois Wade (center), and Chelsea Mathews (right), at an award ceremony for Lummi Nation Community Contribution. Photo credit: Chelsea Mathews. That was five years ago. 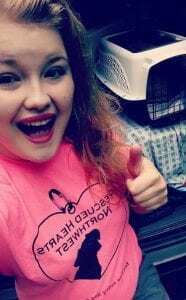 Today, Chelsea’s days are filled with rescuing cats, which includes humane trapping, transport to clinics, administering vaccines, managing adoptions and running the Facebook page. Previously, she worked in retail, banking and attended school to be an x-ray technician. Creatures Comfort adopted out roughly 500 cats last year, and rescued even more. Siva Jacobs, Chelsea’s twin sister in rescue, is a mother of two who holds a full-time job and also fosters dogs on the Lummi Reservation. Photo credit: Chelsea Mathews. With so many cats rescued each year, there is clearly a substantial expense. Creatures Comfort has over 1,900 followers on Facebook. The purpose of the page is awareness. Auto is a declawed, senior cat fostered by Creatures Comfort who had seizures and kidney disease. Photo credit: Chelsea Mathews. After working with Creatures Comfort for a couple of years, Chelsea noticed some cats at Lois’ home weren’t adjusting very well. She decided to do something about it. 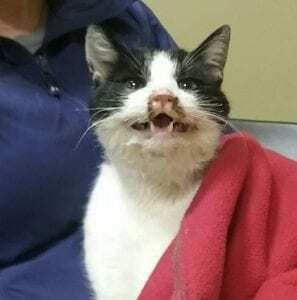 Tux, a Creatures Comfort signature story, was found collapsed on a porch. 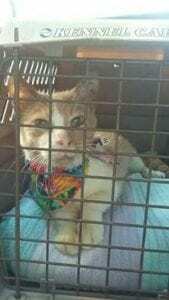 He had respiratory issues and Creatures Comfort helped bring him back to health. Photo credit: Chelsea Mathews. If you’re interested in adopting a Creatures Comfort cat or volunteering, check out the Creatures Comfort website or Facebook page. If you’d like to make a donation, click here or visit their Facebook page.